In January 1991 I had just lost my beloved 1959 International ½ ton pickup to a snapped axle on Snoqualmie Pass. By then my wife had graduated from WSU and moved back to Seattle; I was one year behind her. My only transportation in Pullman at that point was a choice of motorcycles – my Honda CB550 or her 250 Rebel which was still on The Palouse. Outside of The Bookie I saw an ad for a $100 car; from that ad a friend and I got an idea to share a vehicle to deliver pizza on different nights of the week. All told, this car would rack up 35,000 miles in 15 months, and it made a ton of money for whoever sat behind the wheel. 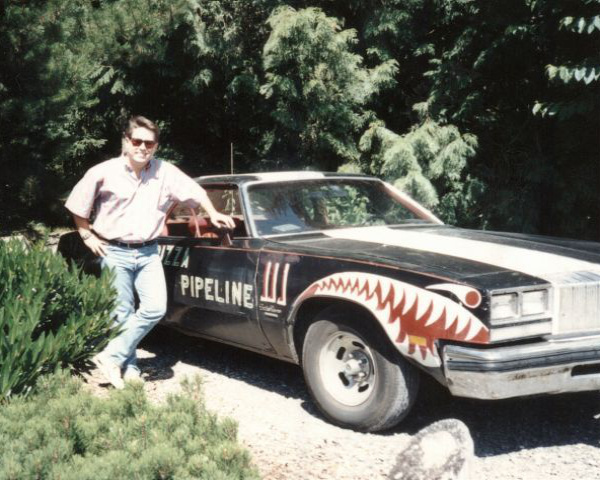 Pizza Pipeline offered us a larger cut of the profits if we painted the company colors on my own car. While I don’t recall exactly how the idea came up to put the teeth on, I do recall that the original name – which got nixed by the shop owner as unprofessional – was “Pie Shark.” The innuendo was all wrong, so the “Food Shark” it became. Food Shark’s teeth and racing stripe were painted on the car in a WSU parking garage while the outside temperature was hovering around 20 degrees F. Obviously the paint didn’t stick too well in that chill, so it was repainted in May after the weather improved. 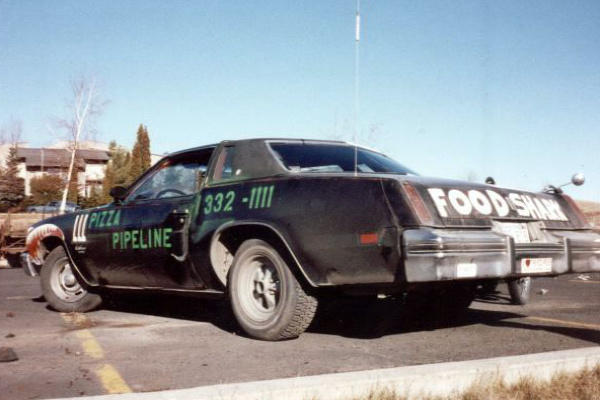 Typical gas mileage for the Food Shark was around 11mpg when delivering, and 18mpg on the road. The Food Shark needed very little to be dependable. I gave it regular oil and coolant changes, did a tune up, u-joints, tires, and true dual exhaust (no emissions testing in rural Washington). It only stranded me only once, when the electronic ignition gave out ($12 fix). Oddly, Shark Tooth got horrendous mileage and averaged a dismal 7mpg while delivering pizza. The Sharks were loved and hated equally in Pullman; as we drove around, children would smile and wave while public safety officials would stare and glare. With the racing stripes and the shark’s teeth, the cars cut a very high profile when on the road. This worked to a financial advantage for Pizza Pipeline but worked against the people driving them, as we were watched very closely by the local authorities. While I tried hard to stay within the law, I still managed to rack up 3 or 4 traffic stops and one messy court date. Paul drove Shark Tooth hard and was pulled over often. In the Spring of 1991 I had attached the front license plate above the driver’s side headlights, in an attempt to keep the plate from coming off the bumper every time I entered a parking lot. I had considered mounting it with zip ties on the grill, but it covered too much and would have caused the car to run hot. I then consulted the Revised Code Of Washington and determined that I could move the plate from the bumper to the upper panel and still be within requirements. Code indicates that the front license plate on a Washington vehicle should be mounted level in such a manner that it can be read “left-to-right” at all times. It says little else, other than indicating the maximum height from the ground (I was within limitations here as well). Mounting it above the headlights was admittedly in a gray area, because top-to-bottom angle was extreme; I asked the Pullman Police Department if they had a problem with it, and they said “no.” Then one summer day, on the lonely way home on Highway 26, I was pulled over by the Washington State Patrol because the trooper didn’t like how the plate was mounted on the Shark. After I showed why I had mounted it in this manner, indicated what Code I had consulted, and that I had spoken with my local enforcement, he tried to cite me for drunk driving (I hadn’t been drinking at all). This incident is one of the contributing factors to my current status as an occasional drinker, and never when I am going to drive somewhere. My favorite memory of the Sharks involved an impromptu session of Front Bumper Scrummage; I was coming back to the pizza place in the Food Shark as Paul was leaving in Shark Tooth. We then went bumper to bumper and pushed each other around for a while. I won, presumably because my car cost $100 and his cost $50. I retired the Food Shark from pizza delivery in December 1991 after graduation from college, using it as work transportation after that. I removed the Pizza Pipeline lettering & logos and replaced them with the simple door inscription “For Recreational Use Only.” In April 1992 – knowing the Shark would never pass the stringent emissions test for the area – it was sold to my brother in law, who promptly parted it out. Paul drove Shark Tooth until 1993 and then traded it in for a new Geo Storm. In December 1991, I had finished the last of my finals at Washington State University. The stunning Mrs. Clark had finished the year before, and had moved back to Bellevue for work after graduating. Now it was my turn to move back. Most of my belongings were locked in storage that we could clear out sometime on a return trip. Everything I needed back home was set to load into the Food Shark. But before I could head back to King County I had to work one final shift at my job delivering pizza Thursday night. My plan was to leave first thing Friday morning. Most WSU students had left for Winter Break. In 1991, about 9500 people lived in Pullman full time when school was out. By 8:00pm it was clear that whoever was left in Pullman was not ordering pizza. So the shift manager offered me an early out; I took the opportunity to go back to the apartment and finish packing. But it didn’t take nearly as long as I thought it would. It was then that I decided to surprise my wife of nearly two years by packing up the Shark and heading to Bellevue early. It would mean driving from one end of Washington to the other under the cover of darkness. In December. A typical daytime trip from Bellevue to Pullman took about 4 ½ hours. Since this one wasn’t typical, I figured it would take somewhat longer. I left before 9:00pm Thursday night. The drive was uneventful, one I had made countless times before; the Shark performed flawlessly as always, pulling down 18mpg between Pullman and Othello. I stopped for gas, coffee, and a snack before getting back on Highway 26 West. Again, more uneventful driving. The world was incredibly dark, with only a few lights here and there at farms and outbuildings along the highway. Outside the air was also cold, hovering around 30 degrees. Thankfully the heater worked great; in fact, what was left of the climate control system in the Shark would dial up 70 degrees and hold it there. With no snow on the ground to battle, driving conditions were excellent. If anything, all the non-eventfullness gave me time to reflect on the last 3 ½ years. The rumble of the Sharks dual exhaust laid down a tone for my brain to register and allow my thoughts to race (music does much the same thing for me). Any plans I had before leaving Shoreline Community College and starting at WSU in August 1988 seemed so distant now. Those plans included a degree in English (which I did get), and a move to the Southwest – either Arizona or New Mexico to start my life again. I had never expected to find someone my own age, or even marry her for that matter. Now I was driving cross-state in the dead of night to see my wife after living apart from her for nearly a year. She was pretty and smart, with a big laugh and a beautiful singing voice. I could have never imagined having someone like her before moving to Pullman. But the future I was driving towards was uncertain. I had no job lined up, only student loans. When told that my degree was in English, the first question people asked was, “So are you going to teach?” Nope. To be truthful I didn’t know what I was going to do. I got the degree because I love to write. Driving west in the Shark without a job was not much different from driving east in the Monza to Pullman in 1988; I didn’t have a job then either, only a dream to get a degree. I don’t recall being overly nervous about finding a job when I got to Bellevue. I only wanted to get home. Near the Ryegrass Hill Rest Area I was getting tired. I didn’t have a watch, and the Shark’s clock accuracy was dubious. Best estimate for time was about 1:00am. No matter what time it was, I had to pull over and shut my eyes for a while – to keep from becoming a danger to others. Because it was cold outside, I slept for a while with the car and the heater running, and then for a while without them. After what seemed to be about two hours, I woke up refreshed and hit the road again for the final stretch. Snoqualmie Pass was mostly clear that night, and the descent into Western Washington brought no surprises; it was raining. Another 40 miles to go and I would be home. The radio stations I had grown up with finally began working on the Shark’s radio. Lights and traffic began to increase. And when I drove through Issaquah I knew it would only be a few more minutes.